Raw performance under Jelly Bean is quite similar to what we saw when ICS was in charge, although there are minor differences which are still worth mentioning. The Galaxy S III performance in the usual processor benchmark we run - BenchmarkPi and Linpack - barely changed after the Jelly Bean update. Finally, the graphics benchmark results came a little lower than before, but that's because Jelly Bean's Project Butter is eating more GPU power. You can't have it all, we guess, but there's still plenty of graphics power remaining for you to use. There is one more thing worth mentioning, though - after the Galaxy S III got its Jelly Bean serving the user-available RAM has been increased to 833 MB. As we said Google Now is one of the most notable new features that the Jelly Bean update brings. 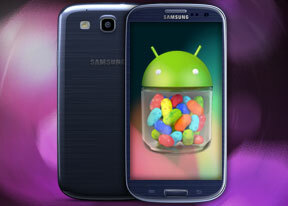 In the simplest of terms, it is Android's version of Siri for iOS, but much more integrated into the operating system. Google Now is way quicker than its competitor at recognizing and answering your queries and while its functionality still leaves something to be desired, it seems like a step in the right direction. Besides being able to recognize voice commands, Google Now will learn from your usage patterns, and display relevant information. For example, if you search for a particular sports team frequently, Google Now will display information for upcoming games you might want to watch. Google Now on the Galaxy S III gets activated with a press-and-hold of the menu button. You can either type or talk to it and the app will give you one of its aforementioned info cards (if available) and read you its contents aloud (you can disable this from the app settings). If there's no card to help with the answer to your question Google Now will simply initiate a Google web search instead. Samsung's own S-Voice service is also on board, and you can activate it with double tap on the Home key as usual. We couldn't find any new features in S-Voice. The web browser may look pretty much the same, but has learned a few cool new tricks after the update. Its interface has two new functional additions - the previous and next page buttons on the left of the address bar and the brightness setting in the advanced menu. The latter is not browser-specific but gives you access to the global brightness scrubber. Adobe is no longer supporting Flash on the Android platform and has even removed the Flash app from the Play Store. However if you had the Adobe Flash Player 11 installed on your Galaxy S III - you will keep the Flash support after the Jelly Bean update as well. Unfortunately, if you reset your device you'll lose Flash, and will have to side-load the Jelly Bean-compatible APK that the guys over at XDA-Developers cooked up.